I do have to eat my hat a little on this one. Its not something that I ever expected to come together. However, when you have support from Nissan Europe, and RML building it with a team of engineers, anything is possible. More than just a motor swap, this is a car swap, a rebody. 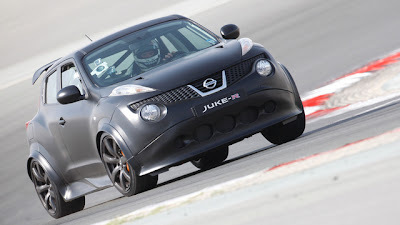 In this post over at Jalopnik, Mike Spinelli takes the GT-R, I mean, Juke R around the track in Dubai on Nissan's dime. The 3,600 lb Nissan specs out with a 0-60 of 3.7 seconds, and a 165 mph top speed, although these numbers might be up for debate. In contrast, the Juke R's shorter wheelbase (by almost a foot!) gives it a more manic temperament than the tank-like GT-R. It's more direct and edgier, changing direction with extra sparkle, but still feels as neutral and easy to predict as its chassis-mate. The higher seating position affects the brain's equilibrium center, amplifying body roll — tweaking the suspension's street tune would correct that — but it's not a distraction during transitions. Head over to Jalopnik for the full story, on their drive of the Juke R.